Mon – Fri – 9:30 a.m. to 6 p.m.
Saturday – 9:30 a.m. to 3 p.m.
Jeffrey S. Bird, RDO, ABO-M, NCLE, AC. After working with industrial optics for several years, Jeffrey discovered professional eyewear design. Returning to school, he prepared for the certification examination at the Optical Institute of New England while working as an apprentice optician. Jeffrey was licensed by the Commonwealth of Massachusetts as a Registered Dispensing Optician in 1978. In addition, he holds accreditation from the American Board of Opticianry (ABO) and the National Contact Lens Examiners (NCLC). His continued studies, writings and wide ranging experience lead to designation as a Master Optician in 1996. His commitment to life-long learning saw Jeffrey receiving a Bachelor of Science degree in Business Administration from Salem State College in order to assure the company’s business practices rival the patient satisfaction levels that their professional services provided. The success in this arena has seen Parrelli Optical voted “Best on the Northshore” routinely over the last ten years. Today, Jeffrey specializes in contact lens fitting, with a particular interest in lenses for astigmatism and corrections for the bifocal wearer. Matthew Mahoney, RDO, ABOC, NCLE, has more than 27 years’ experience in the optical industry. He joined Parrelli Optical in 1988, working in Danvers, Beverly, and other locations, and in 1997 became manager of our North Andover office. On a day to day basis he is responsible for all aspects of prescription eyewear such as educating patients and designing, fabricating, fitting, and the dispensing of eyewear. Matthew is also versed in the fitting and dispensing of the latest and greatest in contact lenses. Matthew attended Newbury College. He is a member of the Opticians Association of Massachusetts and the National Contact Lens Society of America. Over the years, he has enjoyed building a close professional relationship with his patients. He and his team are responsible for bringing the highest level of eye care to everyone who visits their North Andover location. Kevin Diaz, RDO, ABOC, NCLE, joined the Parrelli team in 1985. He has been a licensed optician and contact lens fitter since 1984. Kevin is a graduate of Newbury College with a degree in ophthalmic optics. He is practiced in the fabrication of eyewear and enjoys handcrafting glasses for his patients. Kevin is also a certified contact lens fitter who is particularly skilled at training and dispensing patients who may have difficulties with contact lens handling. Kevin’s specialty is designing and fitting of shooting eyewear, using the latest materials and technology including Randolph Engineering Ranger frame line. He spends his time between the Beverly and North Andover locations. Martha J. Law, RDO, ABOC, NCLE, began her career in the optical field more than 28 years ago in Memphis, Tennessee. She joined Parrelli Optical in 2003, completed her apprenticeship, and is now licensed in Massachusetts as a Registered Dispensing Optician. On the National level, she is also certified by the American Board of Opticianry and by the National Contact Lens Examiners. Martha selects frames for our collection from the latest styles offered by the industry’s leading manufacturers. She works closely with frame company representatives to assure that the frame selection in North Andover is current and fashionable. In addition to keeping up with the latest trends in eyewear, she has extensive expertise in frame materials and lens mounting techniques. Martha enjoys working with her clients to design the perfect pair of eyeglasses for every individual need. Dan Liporto, RDO, ABOC, joined Parrelli Optical in 1993 as an apprentice optician, and after passing the ABO certification exam in 1994, received his Massachusetts state opticians license in 1997. Before joining the Parrelli staff, Dan was an adult education teacher. He is a graduate of Merrimack College with a master’s degree from the University of New Hampshire. Dan also furthered his study of optics by completing the American Association of Opticians certificate course in refractometry. Dan’s skill in frame selection and knowledge of modern lens design enable him to fit patients with the frames and lenses that are right for them. These talents combine to assure that his clients feel good, look good, and see well. Dan demonstrates his versatility and team spirit by dividing his time between the Beverly and North Andover offices. He is a member of the Opticians Association of Massachusetts, the Contact Lens Society of America, and is a Fellow of the National Academy of Opticianry. Elisa Hornedo ABOC, NCLEC joined the Parrelli Optical team in May of 2014. She is a Certified Optician with knowledge of all aspects of eyewear design. Elisa is also a Certified Contact Lens Techincian with an interest in fitting contact lenses She enjoys both spectrums of her career and is devoted to her patient needs. Elisa’s interest in Opticianry was inspired by her father. He has been a licensed optician for more than 25 years. When Elisa was a young girl growing up in the Bronx, her father would to take her to “bring your daughter to work day.” When Elisa was 13-years-old, her family moved to Methuen, Massachusetts where she still resides. Her father’s passion, combined with Elisa’s boundless curiosity about Opticianry, led her to study eyecare and work toward licensure. In 2012, Elisa enrolled at the Benjamin Franklin Institute of Technology (BFIT) to obtain her degree in Opticianry. At BFIT, Elisa excelled in her studies. She found subjects such as ophthalmic optics, the principles and practices of Opticianry, and contact lens theory exciting. The completion of her course work combined with her practical experience lead Elisa to the certifications she holds today. Her commitment to the field and her enjoyment oflearning, will allow her to continue to grow professionally. 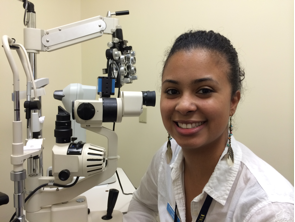 Elisa is also a member of the Opticians Association of Massachusetts and the Contacts Lens Society of America. David S. Metsch, O.D., earned his doctor of optometry degree from The Indiana School of Optometry, and a BS degree from North Carolina State University. He trained at the Veterans Affairs Medical Center in West Roxbury, MA, and has expertise in hospital-based optometry. In 2003, Dr. Metsch was named “Young Optometrist of the Year for Massachusetts” by the Massachusetts Society of Optometrists. Before joining Parrelli Optical in 1998, Dr. Metsch taught at The New England College of Optometry. He has served on the executive board of the Massachusetts Society of Optometrists for many years.